You might have read about the recent research that appeared to knock breakfast off its pedestal as the most important meal of the day. 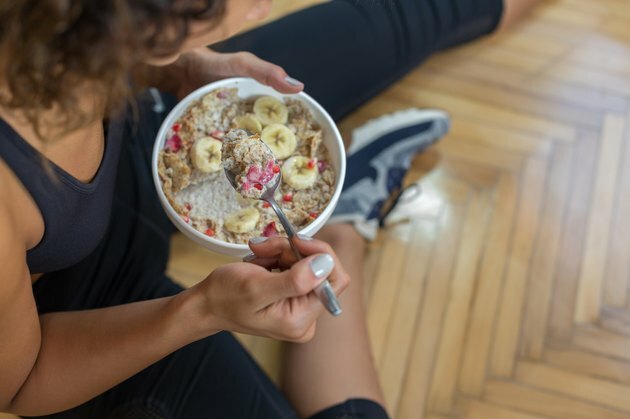 While the research is mixed, and there are plenty of variables involved, most experts support the idea that getting at least a little something in your belly in the few hours after waking, especially if you have a morning workout. Since your body loses water while you sleep, having a glass before eating anything helps to rehydrate you and boost your energy. "I always drink a big glass of water with fresh lemon juice first thing when I wake up," says Holly Jean Cosner, a Pilates master instructor. There's something to be said for maintaining a morning breakfast routine. "I like a coconut muesli every other day, alternating between a collard scramble or a seitan sausage sandwich on the other days," says Joel Harper, a celebrity fitness trainer. The chlorophyll in collard greens can help to balance out the heavy protein in eggs while keeping you full, and it acts as a natural breath freshener, he says. Whole grains are a great way to start the day with a healthy dose of carbohyrates, giving you sustained energy to power your morning. Celebrity fitness trainer Juliet Kaska says that her go-to breakfast is a half cup of brown rice or quinoa with a quarter of an avocado mashed into it for a helping of healthy fats. Having greens for breakfast is a wonderful way to add nutrition into your body from the very first bite. "My current obsession is sauteed kale, chard or mustard greens, with onion and red pepper over whole-wheat pasta," says Kate Hamm, a certified yoga and fitness instructor. "The savory foods are definitely what my body wants." Kale and other dark greens start you with over 100 percent of your daily need for vitamin A, which boosts immunity and can make your whole day feel stronger. When you're training extra hard, you may need fuel both before, during and after a workout. USA Cycling Expert Coach Menachem Brodie says, "My most standard breakfast on the cycling team — on bike training days — is a 16-ounce shake (consisting of 200 grams of 1.5 percent fat yogurt, a half cup chocolate almond milk, quarter cup of frozen blueberries and quarter cup of frozen cherries) and 8 ounces of French Press coffee with milk. Sweet breakfasts can be good for you and satisfying, too. "I enjoy chia seed pudding in coconut milk with coconut shavings, smashed raspberries, topped with gluten-free granola, or Paleo chocolate blueberry pancakes," says Julia Chan, a certified personal trainer and registered yoga instructor. Coconut milk can help boost your immune system, while chia seeds are a nice source of omega-3 fatty acids. Raspberries and blueberries are both high in antioxidants. A liquid breakfast can give your body the fuel it needs faster. "If I am going to work out early in the morning, I eat half a banana and have a drink of milk and prune juice," says Shari Portnoy, a registered dietitian and certified fitness trainer. "I always have water with me. On the days I am not going to work out in the morning, I just have the drink." Both prune juice and banana can promote regularity, while the prune juice is also a good source of vitamins K and C, encouraging strong immunity and energy. Consuming protein first thing in the morning is a great way to ensure that your muscles have fuel for their daily functions. "Most mornings I have a shake with a frozen banana, a cup of almond milk, small scoop of peanut butter, and a scoop of vanilla protein powder, within 30 minutes of waking up," says Matt Tanneberg, a sports chiropractor and certified strength and conditioning specialist. Saving as much time as possible in the morning is important to Michael Jodscheidt, a certified personal trainer, weight-loss specialist and fitness nutrition specialist, so making his meals ahead of time works for this busy dad. "I want something that is healthy and will fuel my body properly for my long busy days, so I make overnight oats loaded with fruits, nuts, Greek yogurt and oats that I can bring with me on the go if needed, with organic hard boiled eggs, and coffee in any way, shape or form." Oats are rich in antioxidants called avenanthramides and a great source of soluble fiber that can help lower cholesterol.